Alton L. Meyer, born Aug. 5, 1921, New Orleans, LA, enlisted in the USN on Feb. 10, 1942, and was discharged on Oct. 21, 1945. He served aboard the USS West Virginia (BB-48) as yeoman 1/c. He graduated Soule Business College, American Management Academy Management Course, 62nd Advanced Management Program of Harvard University Graduate School of Business Administration. He retired from Bemis Co., Inc. on May 1, 1979, as vice-president and general manager of the specialty products division after 39 years of service. 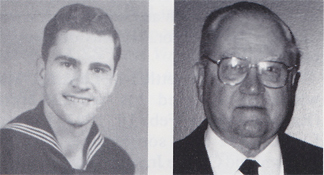 Married to Mary Alois Miller on Feb. 4, 1944, and they have three children: Thomas L. Meyer, commander, USN (ret. ); Nancy Meyer Levert; and Mary Ellen Huston; and six grandchildren.